There was a time when console manufacturers made a point of having first-party sports sims on their machines but that era's long since passed. 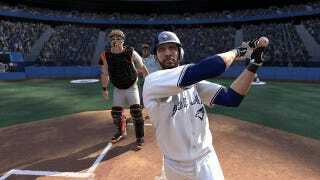 Sony's The Show franchise carries on that legacy and, after a few pitches in the dirt at first, the PS3 exclusive baseball franchise is enjoying a run of acclaim for the last few years. So, it's safe to say that next year's entry in the bat-swinging series is hotly anticipated. The screens above give a glimpse at the visuals from MLB 12 The Show, including looks at Orioles outfielder Adam Jones, Orioles third baseman Mark Reynolds and Blue Jays outfielder José Bautista. You'll also see Padres third baseman Chase Headley, Padres starting pitcher Mat Latos and Marlins shortstop Hanley Ramirez, too. More details about game features and modes are surely forthcoming but, for now, bask in the sunny splendor of these virtual ballpark heroes.